World wine production rose 12 percent from 251 million hectoliters in 2017 to 282 million hectoliters or 7.5 billion gallons in 2018; one hectoliter is 26.4 gallons. 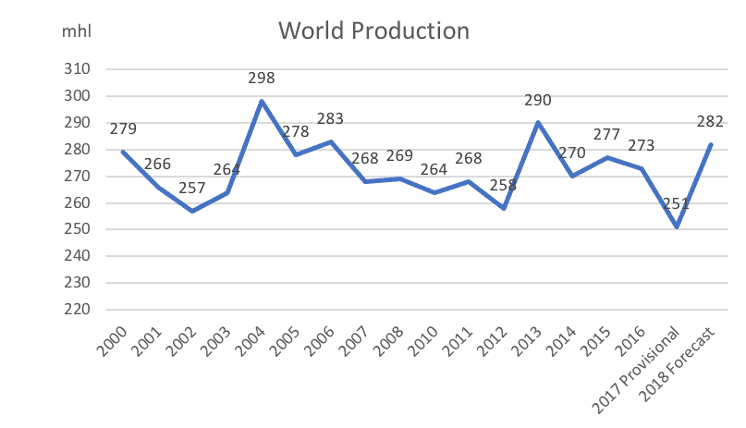 The highest global production was in 2004, when almost 300 million hectoliters was produced, followed by 2013 with 290 million hectoliters. Italy produced 17 percent of the world's wine in 2018, followed by France with 16 percent and Spain with 15 percent; these three countries produced 48 percent of the world's wine. The US was the fourth largest producer, accounting for eight percent of the world's wine in 2018, followed by Argentina and Chile, five percent each, and Australia, four percent. European wine production rose in 2018 after droughts and frosts reduced 2017 wine production. Germany produced 9.8 million hectoliters, Portugal and Romania about 5.2 million hectoliters each, and Austria's three million hectoliters matched New Zealand's three million hectoliters. South Africa's drought reduced wine production to 9.5 million hectoliters. Spain produced the most wine per person in 2018, 23 gallons, followed closely by Italy, 21 gallons, Chile, 19 gallons, and France 18 gallons. US wine production was two gallons per person. Europe had four million or 53 percent of the world's 7.6 million hectares of grape vineyards in 2017, led by 970,000 hectares in Spain, 790,000 in France, and 695,000 in Italy. Portugal had 195,000 hectares, Romania 190,000 hectares, and Greece and Germany about 100,000 hectares each. These vineyard areas include table, raisin, and wine grapes. There were 3.6 million hectares of vineyard outside Europe in 2017, including 870,000 in China, 450,000 in Turkey, 440,000 in the US, 225,000 in Argentina, 210,000 in Chile, 145,000 in Australia, and 130,000 in South Africa. World wine consumption in 2017 was estimated to be 245 million hectoliters, less than wine production and trending down from a peak 250 million hectoliters in 2007-08. The US consumed the most wine, 33 million hectoliters in 2017, followed by France, 27 million, Italy, 23 million, Germany, 20 million, China, 18 million, UK, 13 million, and Spain, 10 million. The four leading wine-consuming countries, the US, France, Italy and Germany, accounted for a third of the world's wine consumption in 2017, and the leading 10 countries consumed two-thirds, the top four countries plus China, UK, Spain, Argentina, Russia, and Australia. About 43 percent of the wine produced in 2017 was exported. Spain was the leading exporting, sending 22 million hectoliters abroad, followed by Italy, 21 million, and France, 15 million. These three countries accounted for 55 percent of the volume of wine exported and almost 60 percent of the value of wine exports, which were $35 billion. France exported wine worth $10 billion, Italy $7 billion, and Spain, $3 billion. About 55 percent of the wine exported was bottled; 45 percent was sent abroad in bulk bladders that fit inside a standard shipping container and contain 10,000 liters. Bulk wine is often bottled in the importing country. About 8.5 million hectoliters of sparkling wine was exported, representing eight percent of wine exports but almost 20 percent of the value of wine exports, which were about $35 billion. The five major wine importing countries by volume, Germany, UK, US, France, and China, accounted for over half of wine imports in 2017. By value, the US was the leading importer, followed by the UK, Germany, China, and France. France imports bulk wine from Spain and blends it with French wine.